What if your grocery bag could help you make smarter food and ingredient choices while you’re doing your online shopping? BagIQ instantly syncs user purchases made at 100+ grocery chains, including Walmart, Amazon, Target, Walgreens, Safeway, Stop & Shop, Instacart, Fresh Direct, as well as online food delivery services such as Seamless and Grubhub, with more merchants being added weekly, and gives you the nutritional value – and can even make suggestions for healthier alternatives. For purchases made at stores and restaurants outside the network, a single-click photo of a paper receipt captures and imports all the data required for BagIQ analysis. 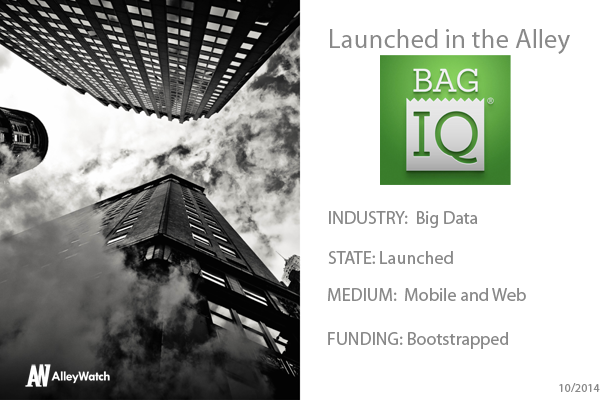 BagIQ is the first digital health and nutrition system to leverage passively streamed food data from supermarkets and restaurants, allowing consumers to effortlessly collect their complete food purchase history, enabling everyone to benefit from the power of food and nutrition “big data” to inform, guide, and improve their food purchase decisions and, ultimately, their health. It also syncs with Apple HealthKit and Google Fit, will change the way consumers make food purchasing decisions by automatically logging every food item or meal purchased online, with a loyalty card or with a single-click photo of a paper receipt, analyzing the ingredients, nutritional value and price and giving it a score. BagIQ uses this data to suggest alternative products that better fit the user’s individual health goals and lifestyle. BagIQ scores food items and overall purchases from 1-1,000; the healthier a user’s choices are, the higher their score. This numerical system is also applied to important, individual metrics, such as the amounts of sodium, fats, sugar, calories, carbohydrates, cholesterol, fiber, etc. found in each item, making it easy to determine how healthy it is and to identify one’s problem areas. This nutritional data feeds BagIQ’s comparison and recommendation engine that then identifies products that are better matches for each user’s personal nutrition goals, facilitating the small changes that can make a big difference in their scores and their overall health. Additionally, BagIQ identifies and explains product attributes, such as questionable or controversial ingredients, misleading terms, highly-processed or GMO foods, etc., to help consumers make more informed choices. BagIQ is the only system that, like Fitbit or Mint.com, passively collects data, eliminating the need for food logging and offers both full analysis of all ingredients and suggestions for healthier foods that allows you to make the small changes that make a big difference. What markets are you attacking and how big is it? Nearly everyone is trying to eat healthier, so this is targeted at both health-conscious consumers, as well as marketers and retailers who want to provide full data to their consumers. Quantifiable evidence from 1M+ BagIQ users that better informed, data-driven food decisions lead to healthier, happier people. There are so many great and innovative investors that we’re happy to speak with everyone. If we absolutely had to choose one that we feel would be a good fit, we’d have to say the “small, collegial, partnership” (their words) of Union Square Ventures. They have an amazing track record and portfolio full of potential partners that could help us spread the word about the benefits of better food and better health that BagIQ can deliver. First of all, this is where we live but, but just as importantly, New York’s tech community is thriving and dynamic and we are excited to be a part of it. What’s the #1 most purchased food staple? We will be able to tell this once we are fully launched. Morgan’s BBQ in Prospect Heights, Brooklyn. I grew up in South Texas & can solemnly swear the “moist” brisket at Morgan’s rivals anything you’ll find during your SXSW boondoggle.